The Haast's eagle (Harpagornis moorei) was the largest eagle ever to have lived. It is the only eagle in the world ever to have been top predator of its ecosystem. It lived on the South Island of New Zealand, where there were no other large predators. 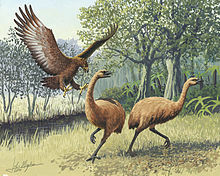 Fossil evidence shows that the areas where the Haast’s eagle lived were covered in forest and shrublands, as well as in the grasslands on river floodplains. The arrival of people in New Zealand had unfortunate consequences for the eagle. By 1400 AD, most of the forest habitat it used had been cleared by fire, and most of the large flightless moas that it ate had been hunted to extinction. This page was last changed on 25 January 2015, at 16:02.